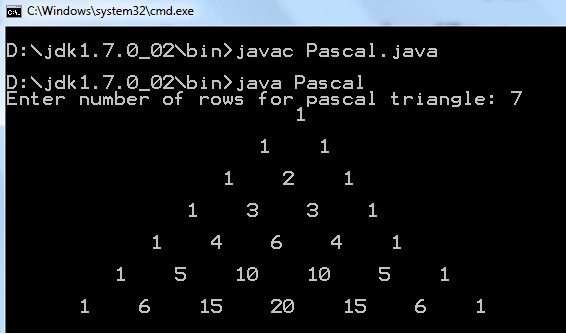 It is a basic program to generate pascal triangle in Java language. It is a triangular array of the binomial coefficients in a triangle. Named Pascal comes from French mathematician, Blaise Pascal. In the program user input number. It generate rows for input number. In first row there is only the number 1. From all next rows, add the number directly above and to the left with the number directly above and to the right to find the new value. 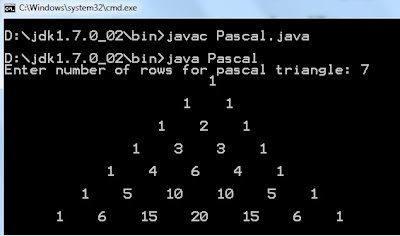 Save Program at your system by name "Pascal.java".